Founded on a belief in the liberating power of culture, Le Pavé Dans La Mare in Besançon is presenting a political interpretation of the world, taking a critical, transversal approach. What makes this centre d’art unique is the link developed over the years between companies and artists (artwork production, artist residencies in companies, the sharing of know-how, mediation directed at new sections of the public). 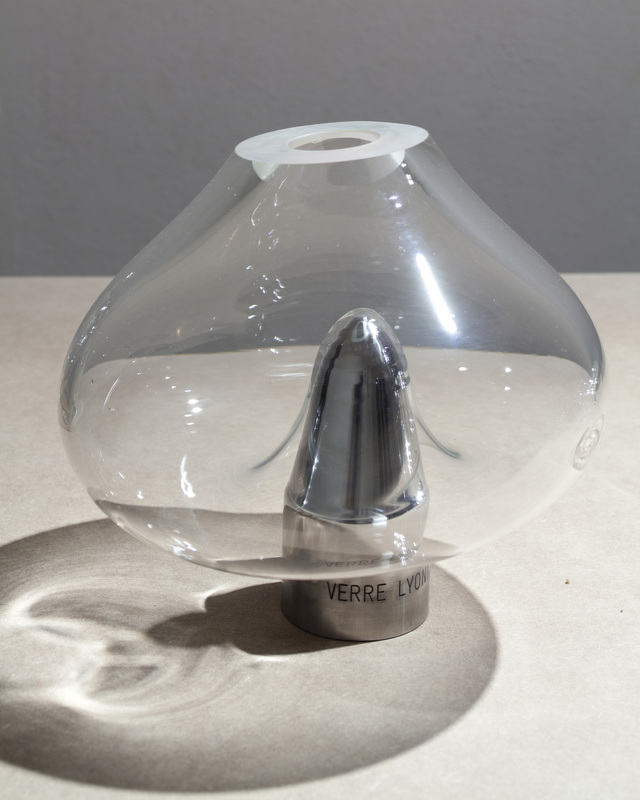 Laurent Devèze delivers a personal, critical vision of a work Nicolas Floc’h created in the context of a partnership with the company Mantion and the glass factory in La Rochère. The centre d’art Le Pavé Dans La Mare has established privileged connections with the corporate world, thanks to initiatives leading to the production of art works such as patronage and the establishing of artist residencies. 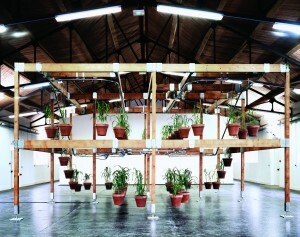 Nicolas Floch’s “Module Réf. 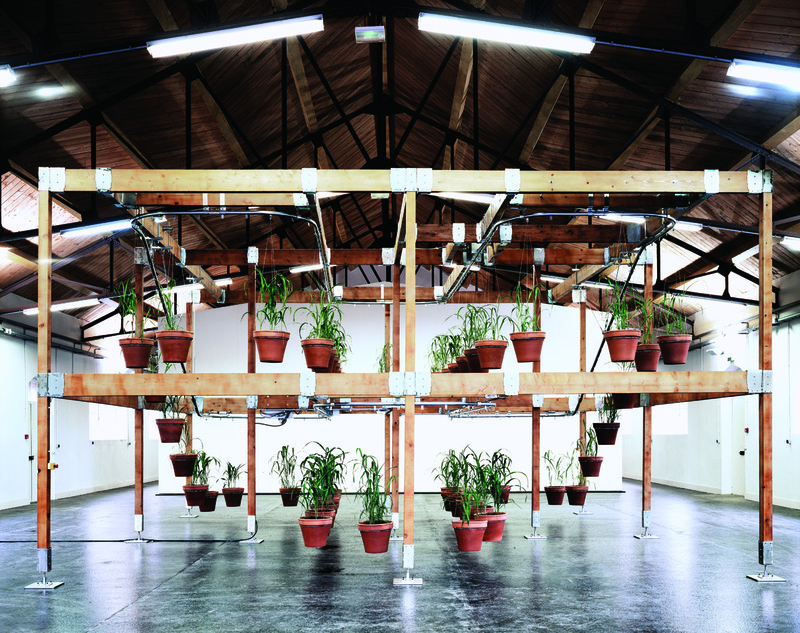 9030”, living sculpture is an amazing piece of artistic creation ; it combines in its primary form the living aspect of vegetation with a conveyor mechanism. The artist willingly entered in the spirit of the game of creation, using materials, products and processes of the Mantion company. The art work was shown in 2010 at the Besançon Citadelle and was then transformed in 2012 at the glass factory of La Rochère. Nicolas Floc’h adapted “Module Réf. 9030” to the new environment offered by the space and especially by the workshop in the glass factory in which the sculpture blends until becoming one of its constituents. 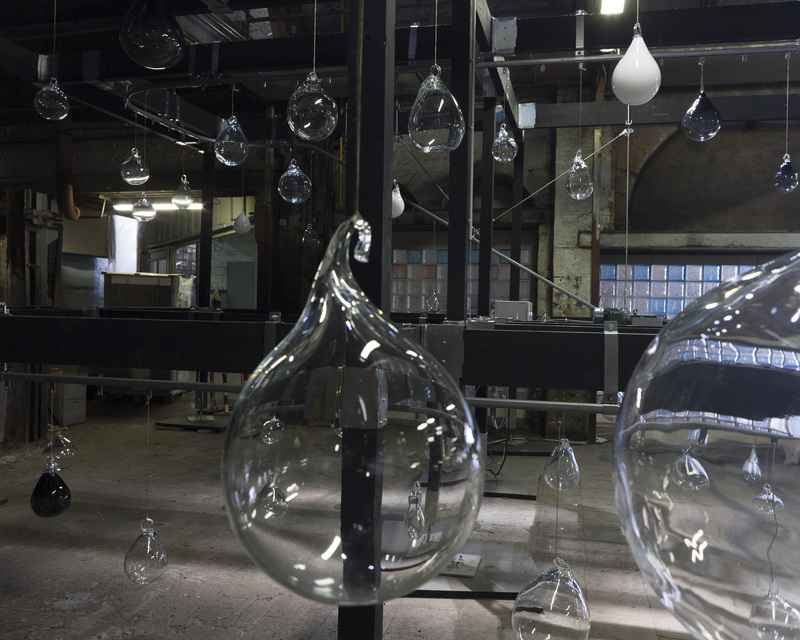 The artist worked with the glassblowers to produce 80 white blown glass bubbles, in the initial shapes before any manual transformation. These bubbles were hung up to the overhead circuit and follow circular figures in space due to two levels of tracks. The art work “Module Réf. 9030” has been realized thanks to the Mantion company (industrial production of fittings for sliding doors) and to the support of the oldest active art glass factory in France, La Rochère. Being an art centre is to assume being a nerve centre. Both a sensitive place where forms and concepts are invented and a starting point from which flow various, multiple pieces of information that are as paradoxical as needed. More so, the receptacle of the world strains, even sometimes convulses and the melting pot of a universe which is never an environment since it will not play the role of being simply decorative. However, it is doubtless because of this double flow, because of this almost organic breathing, that an art “centre” is never a centre as defined by conventional geometry: a fixed determination aiming to be considered as a fixed reference, the so terribly called “blind spot”. The Pavé Dans La Mare, as its eloquent name implies, cannot elude this thought: a stone thrown into the water creates waves which not only skim the surface of the pond to its farthest edges but also makes ripples forever possible. In short, a mere stone thrown into water makes us forever unable to believe in any perennial stillness of things. Creating turbulence and ripples and welcoming them in return, should be the mission of the art centre. It should not unilaterally spread the aesthetic good word, nor should it give birth to ready-made preset works; it should rather fit into an “élan vital”, a vital drive which the author of Matter and Memory would not have denied. While elsewhere the temples distil to a public necessarily chosen from among the faithful more and more elaborate preconceived selections, the art centre remains irreplaceable because of its rhizome-based mission which cannot be separated from a constant exchange of sap with as many as possible. Yet at the heart of this impulse prompting the art centre lays the relationship it enjoys with the artist and the territory. Technical and aesthetical exchange, established complicity, trust, all of these factors contribute to a plural production which is as distant as possible from the antique bourgeois conception of the art work as a solo work born only from the mind and the wretched hands of the inevitably cursed creator. But this dialogue, in which the high complexity and intimacy should one day be described, can reveal its truth only if it occurs somewhere. This topology of invention is in no way commonplace, contrary to what the above might suggest. Once more, the place is not a mere localization. Because of the very nature of its mission, an art centre maintains with its territory the same relations that a grand cru maintains with its soil. People have made hundreds of attempts to plant the same grape varieties in identically composed soils located poles apart from their original soils; hundreds of times all over the planet, they have been disappointed by the results. It is probably because such an origin cannot be reduced into an inorganic chemistry equation or into the most advanced pedological analyses. The secret of the process probably owes more to the variations in micro-climatic sun exposure due to the different orientation of the various slopes and also to a human chain of know-how and knowledge involved from grape-harvesting to the wine-making process. A very good wine will never be tasted only on the basis of its organic composition. In other words, if the heart of the art centre can beat to the rhythm of the world, it is because its permanent invention throbs and organizes itself within it and moreover because the perpetuum mobile which drives it ensures its grounding. The story of the art centre is written year after year by these bonds woven with craftsmen, businesses, territorial authorities and sometimes neighbours whom it has been able to both listen to and enrich by its experience. An art centre makes creation exist by localizing it and this embodiment is all the more relevant when it gives to the artist not only the means to create but also the means to surpass himself. Considering this aspect, Nicolas Floch’s example is the most eloquent. Firstly, the work was born because of the dialog with the Mantion Company made possible by the Pavé Dans La Mare. Nowadays, this company sees an artist’s request as an opportunity to demonstrate its exceptional technical capacities beyond the usual boundaries of business, and well beyond its present or potential clients. Through the demands of the artist, the company is able to publicly show its know-how. But the mystery of this all defining relationship between the artist and the art centre is made even clearer when the work is given a second life thanks to a second presentation linked to a new partnership. Indeed, the traditional techniques of the glassblowers in La Rochère will follow the mechanical structures made by Mantion, thus allowing the artist to play with this new opportunity. The plants which swirled as in a robotized assembly-line at the Hangar aux Manoeuvres of the Besançon Citadelle have now mutated into tears or translucent water drops at the glass factory of La Rochère. Nowadays the artist is like a composer who knows how to orchestrate his score depending on the various instruments available. Moreover, the work seems to include all the others, almost implicitly, and that is what makes its importance. Indeed, who would grant Bach less genius just because his concerti make the brass or the strings resonate with the same power and subtlety as the great organ pipes? Nicolas Floc’h is an author in the full meaning of the word: he has succeeded in giving birth to an Ovidian creation able to change according to the various partnerships, revealing its deep essence and its amazing plasticity, without diminishing its integrity in any way. The work is precisely the whole collection of its potential transformations, a rare creation which includes in itself all its future transformations. The artist – who is more than ever deep in the heart of his subject – has succeeded, through this dialogue with the art centre and its territorial partners, in creating a monadologic, living work, challenging more than others the question of nature since it can evolve internally in reaction to the extreme variety of external demands. However, the success of such an adventure finds its complete meaning in this attempt to define what an art centre such as the Pavé Dans La Mare is today: both a collection of projects and melting pot of their transformations. To exceed the artist’s fundamental desires in order to help him determine to which extent he may push his initial concept. To help him create and not only to reify, which means to assist him in becoming aware of the way his original concept may lead his ambition to the extreme. A little like the test pilots who demonstrate to the engineers or inventors how their inventions may fly farther, higher, faster than they had themselves expected. This transcendence is necessary to a creation which attempts to stay alive and which does not want to be enclosed in a mere production of a fixed object; but it could not be done without a deep territorial understanding which is the only way to give rise to complicities and to manage the effects of a work, including the responses which it deserves and which it calls for.